Fr. Antoniu Petrescu, 34, above, is a Romanian who became a priest in Italy in 2004. Today he is a parish priest in Avezzano, in the province of Aquila, Abruzzo. During the day he carries out normal priestly functions; at night he becomes a rock star performing on stage. His great passion is to imitate his idol: Elvis Presley. Bishop Lucio Angelo Renna of Avezzano gave his permission for Fr. Antoniu to lead this double life. Below, Bishop Renna is pictured ordaining Fr. Antoniu. The Bishop told the priest to be "a brave boy" on stage, but not to forget his pastoral duties. The new Bishop of the city, Pietro Santoro, also looks favorably at the priest's performances. Here you have another sample of the bad fruits of Vatican II. A reader from Romania sent us this information, asking us to do something against this clear deviation from the Catholic vocation of a priest. album posted by him on his website. Below, we placed the English translation of two videos in Italian where the priest gives a sample of his performances. The reader who is not familiar with Italian can print a copy of these English translations to understand what is being said during the presentations. The first one is a TV report on the double life of Fr. Antoniu. The second is an interview and performance on the Piazza Grande Show, also on Italian TV. To watch the first video, click here. Speaker: A priest, he is a true priest with a passion for rock. Fr. Antoniu, parish priest in the province of Abbruzzo; in the morning Fr. Antoniu celebrates Mass; in the evening he sings the music of Elvis Presley. We meet him do talk about his music. They call him Fr. 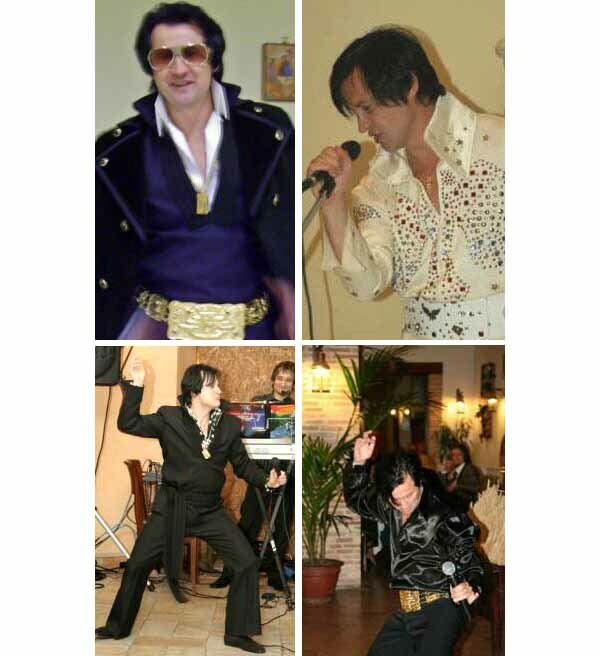 Elvis – the priest we have met - in the morning … but in the evening he transforms himself into the King of Rock and Roll. Fr. Elvis: I am always a priest, Fr. Antoniu, for the friends who like it, I am also Fr. Elvis. Speaker: Fr. Antoniu Petrescu priest of Avezzano, a priest who takes care of his parish during the day, in the evening he is a rock star. Fr. Elvis: I am putting on a jacket of the 1960s. Fr. Elvis: The Lord gave me a gift, and I don’t see why should I bury it. Speaker: In the church he celebrates a wedding, then after he performs at the wedding feast of the spouses. Fr. Elvis: St. Augustine said and repeated that he who sings well prays twice. Fr. Elvis: Since I was a child I nourished a special affection for Elvis; my parents adored him ... I can say that I was raised with his music and his myth. Speaker: This did not prevent you later from being touched by the priestly vocation. Fr. Elvis: In my years in the seminary, I had to add another dimension to that love. Speaker: Yes, and the music always remained in your heart. But how was it possible for you to reconcile the two things? Fr. Elvis: On the altar I am Fr. Antoniu, on the stage I am always Fr. Antoniu, but I transform myself into Fr. Elvis, if I may say so, or Antoniu Aloys, if you prefer. Speaker: Fr. Antoniu does not do this for profit, he performs with non-profit aims. But what do your parishioners and those who know you think of this double life of yours? Fr. Elvis: The majority of people encourage me to go ahead on this road. For my part, I try not to hurt the religious sensibilities of anyone. And I share with them the positive vibrations that I experience when I perform. Fr. Elvis: Deep down, it is a healthy entertainment. Fr. Elvis: My superiors told me to be the brave boy. I believe that their interest is for me not to stray from my pastoral purposes and spiritual way, and that these night performances are not a goal in themselves, but have a goal of evangelization. Speaker: I believe that the youth talk about you in a good way: A priest that loves music and sings well. But it seems that the Bishop in your place has changed. What about this Bishop, does he also love rock or agree with it? Fr. Elvis: That's right, a new Bishop came. We still haven't had the chance to speak, but I take advantage of this opportunity to thank him for giving me permission to come here. Speaker: We also thank him. Fr. Elvis: So, let’s applaud him: (applause). Speaker: Bravo! Bravo! Thank you, Fr. Antoniu. We offer our best wishes for your future. Fr. Antoniu Petrescu, lover of music but also of his work as a priest.